Retreat 2018 – Balance and laughter! 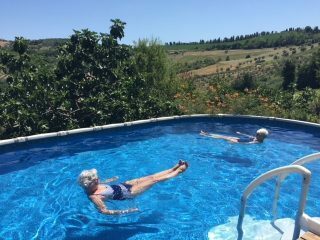 After teaching several yoga retreats at Shanticentre in the lovely Abruzzo, Italy I have learned that everything always works out exactly as it should. And July 2018 was no different! This year, the attendees were an active bunch of yogis. As before, the yoga experience varied from very little to rather a lot. And the inclusion of my partner, Mark Southworth (who has worked as a film stuntman for many years) brought and additional element of physicality to this particular retreat. Not that any of the ladies were much concerned about this – They chose postures like Crow and Headstand to take even Mark to the edge of his comfort zone! particularly gentle and restful quality. Several tears were shed, including mine. Yoga has a way of doing that, doesn’t it? This beautifully calm place in the sun has a way of wheedling out the emotional hitches and then just gently allowing them to float away. We ate, of course – Well, and often! It is Italy after all. The gorgeous vegetarian fare at Shanticentre was supplemented by 3 meals out, at which I indulged in delicious seafood every time. Who can resist a fresh plate of homemade Italian pasta with clams, or freshly fried Frito Misto (Simply: Fried Seafood)? And supplemented by the fine wine and olive oil, which is of course a local speciality. And alongside all of this: A lovely feeling of friendship and bonne homie with like-minded souls sharing the pranayama, the asana, the gentle teachings on the yamas of yoga and the beautiful quiet of Italian hilltop villages, rolling hills and the hot, hot sun, observed from a hammock or the warmth of the hot tub. 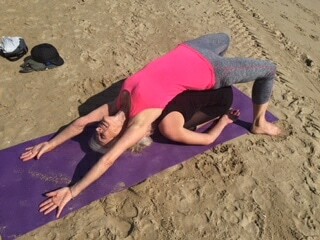 By the end of the week, legs and bottoms were firming up from all the Warrior sequences, hips and shoulders were opening from deep and slow yin yoga on the terrace, and we were ready for the beach yoga session. This ends every retreat in a climax, and results in some great photo opportunities. 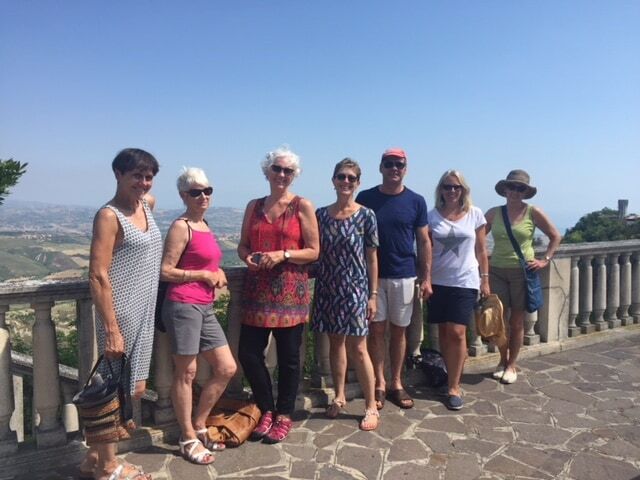 Despite a madly delayed return flight, we arrived back in the UK stretched, rested and happy. 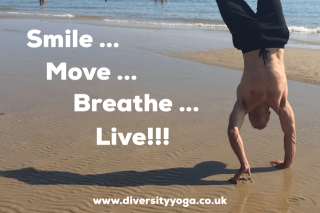 The next Italian adventure from Diversity Yoga starts on 1st July 2019. Would you like to come along? Then email me here for more information. No previous yoga experience is required. 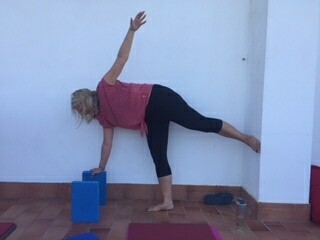 Please don’t be concerned about the advanced balances shown in these photos. They are not usually included in the yoga practice, unless requested by attendees. This year, there will also be an opportunity to pay for your place in instalments. 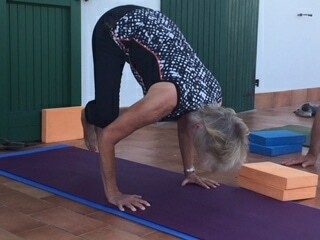 I look forward to sharing the joy of Shanticentre and yoga in the sun with you! Yoga for handling Stress and Anxiety – can it really help? What’s The Difference Between Yoga Therapy And Yoga Classes? Subscribe to our newsletter to keep up-to-date with events and special offers, and get 10% off your first book of tickets!